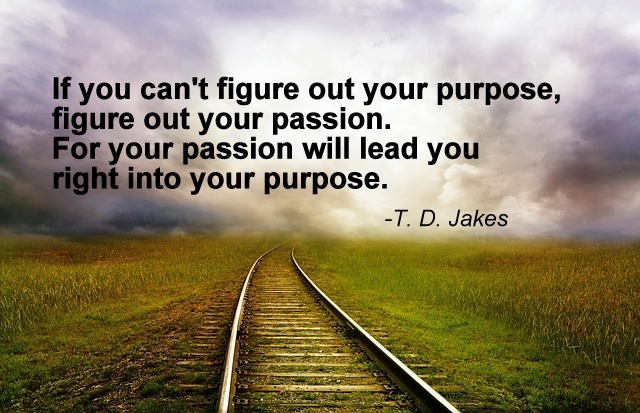 Do you know your purpose in life? If not, let me ask you another question, do you know what you are passionate about? Answering this second question can give us some great insight into discovering and articulating what our purpose is. If you’ve been following along in this series, you know that I’ve challenged readers to consider whether they are really living their lives on purpose. If you’re new to this series, ask yourself, are you truly functioning in your unique niche in a role that lets you come alive and tap into the full breadth of your creative potential? Or, are you one of many unfortunate individuals that are stuck in a job or a career that leaves them feeling unfulfilled – or worse – miserable? If you can’t say for certain that you are functioning in your area of purpose, I suggest you consider three things: your strengths, what you are passionate about, and what other people will pay you to do. Where the three come together, there you will find your niche – the key to your life of purpose. Having further explored the concept of strengths last month, this post is meant to help you identify your passions. More than anything else, the things we are passionate about have a profound motivational effect on us. Rarely will someone give 110% effort to a cause, project, or effort that he or she is not excited about or committed to. Top performers don’t become top performers because they are indifferent about their work. They become top performers because they practice, read about their subject matter, talk about their ideas for improvement in their “free” time. They’re known for showing up early and/or staying late when they need to get the job done or inspiration strikes. Only loving what you do and believing in the cause you work for can sustain that level of motivation. Now, this is not to say that a balanced life is not important – family, loved ones, and relationships outside of work matter immensely – but most top performers cannot segment their lives completely into work and non-work categories. Luckily, the reverse is true as well. If we study our motivations, we find clues about what we are passionate about. So, get out a pen and paper and consider the following questions: when do you feel most committed to a project or cause? When do you find yourself going the extra mile for someone or something? What topics make you light up with excitement when you talk about them? What topics make it impossible for you to bite your tongue or hold back your opinion? Then, look over your answers. Do you see any patterns emerging? In addition to looking at what motivates you, ask yourself, what makes me angry? Not necessarily the “you just cut me off in traffic” anger or the more interpersonal “you never listen to me or my ideas” type anger. I’m talking about righteous anger, the “this breaks my heart and it shouldn’t be allowed to happen” anger. The kind of anger that swells up inside and makes you want to change something, so no one else has to feel what you felt or experience what others have experienced. And finally, ask yourself, what breaks my heart? Many of these things will likely be closely related to the things that make you angry, and help you even better articulate the causes you are passionate about. You might notice, however, some new themes pop as well. What tugs at your heart strings? Makes you tear up – even if you try to hide it? Perhaps it’s seeing parts of our environment destroyed, animals being mistreated, individuals struggling with illness, homeless children, taken advantage of blue-collar workers, individuals who struggle to find work, or unethical decision making that impacts many throughout an organization. Personally, if someone asked me what I was passionate about, I would tell them that I love creating opportunities for others to discover their unique strengths and increase their sense of self-worth. I’m passionate about leadership and teaching people what it means to be a servant leader. I get fired up when I read statistics about the lack of female leaders in business, politics, and social sectors combined with the statistics about the high rates of eating disorders, plastic surgery, and self-loathing among women. And I just can’t help myself from speaking up when someone suggests that women don’t have what it takes to be leaders. And last but not least, it breaks my heart when I see women – young and old – whose self-doubts hold them back from pursuing their dreams or even daring to dream. What about you? What are you passionate about? What sparks the fire inside of you that cannot be easily put out? What is the fire that will keep you going when challenges arise, you’re struggling for success, and sacrifices are required? What is the fire that inspires you to innovate, challenge the status quo, and strive to make a positive difference in this world? All of us will answer these questions differently, and there’s many worthy answers out there. Don’t worry about finding the “right” or the “best” answer. Worry about finding the answer that resonates with you and your heart. It’s the second step in discovering what unique impact you were meant to make in this world. It’s the second step in discovering your purpose. This entry was posted in Leadership Lessons and tagged Calling, Career, Leadership, Passion, Purpose, Strengths by Inta-Great. Bookmark the permalink.